You all know I signed up for the DR Seuss Book Club a while back and we are LOVING it!! They are offering a special deal in celebration of their Birthday!! You will receive a FREE Audiobook with the offer below while supplies last!! 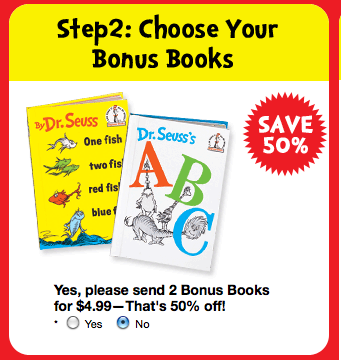 Right now you can get a Dr. Seuss Backpack AND 5 books AND a FREE Audiobook for only $5.95 + FREE shipping! 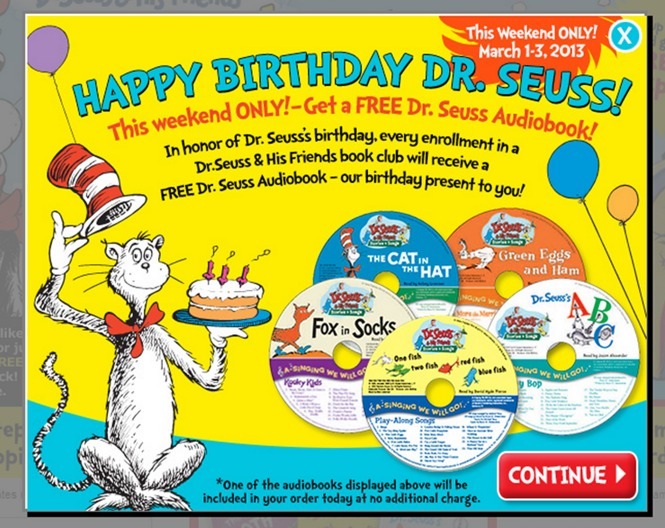 *Note that this is only available during the Dr. Seuss Birthday weekend celebration March 1 – March 3, 2013. You just need to sign up for the Dr. Seuss Book club (please note – this is NOT the normal “book club” where you are committed to purchasing more books – you will just need to cancel after you get your shipment as stated below). You just need to place your order for 5 of the books + a FREE backpack + FREE shipping! You can also choose to order two more books for another $4.99 so, 7 books plus the backpack for just $10.95 shipped OR you can “Uncheck” the box (as seen below) to not add the 2 other books making your total $5.95 for 5 book and a backpack shipped. **Once you get your items in the mail, you can then go into your account online and cancel the club membership, you won’t receive any more shipments and are not required to purchase or pay anything else. Free colorful Cat in the Hat Backpack to carry all your books in. Free Dr. Seuss & His Friends Audiobook read by Jason Alexander, David Hyde Pierce or Kelsey Grammer. Thanks Raining Hot Coupons for sharing this great deal!